Human rights activists are concerned about the grave humanitarian situation in besieged Kurdish towns of southeastern Turkey. Ankara is to face a trial in Strasbourg over its security forces’ operation which is due to be over by the end of January. 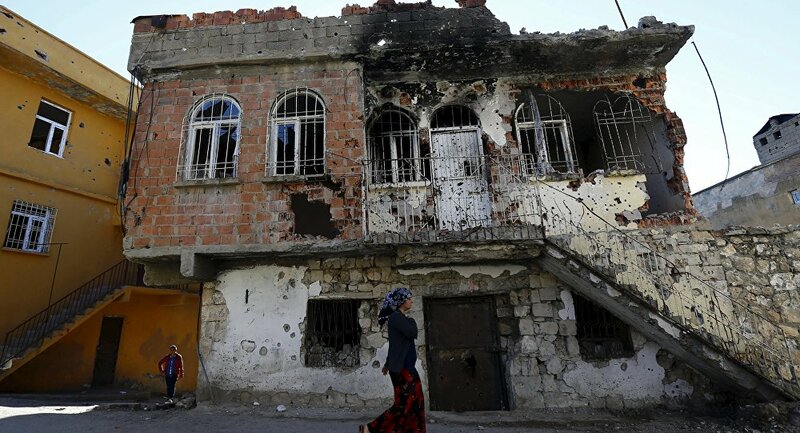 Schools remain closed in areas under curfews, civilian death toll along with the number of displaced people rises as bloody clashes between government forces and local youth resistance continue across major Kurdish towns in Turkey’s southeast, according to multiple reports. Ozturk Turkdogan, a prominent Turkish human rights activist expressed grave concern about the current situation, in which civilians, including women and children, are being killed every day, he claimed, while the government is preventing human rights activists from visiting the areas under blockade. 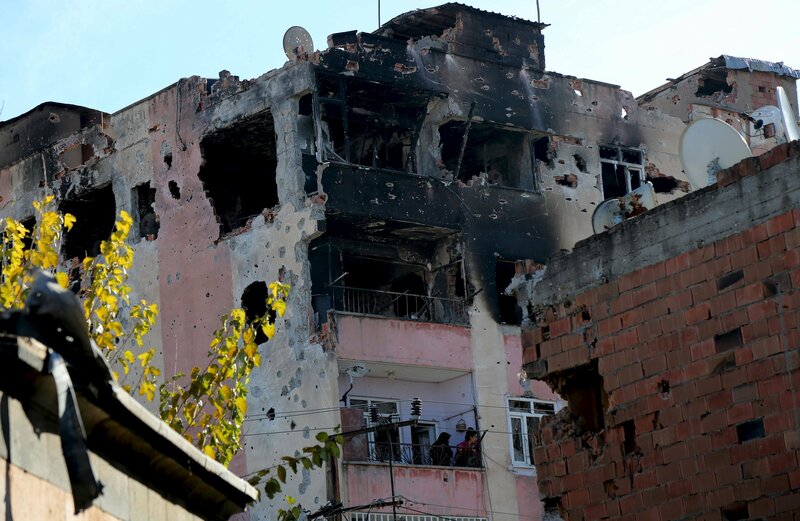 “Several times we formed committees to go to Silopi and Cizre to see the situation at close range, but the government deterred us from attempting to visit there,” Turkdogan told Rudaw news outlet. Relatives of Siyar Salman mourn over his grave during a funeral ceremony in the Kurdish dominated southeastern city of Diyarbakir, Turkey, December 15, 2015. According to local media, Salman, a 19-year old man, was killed on Monday in Diyarbakir during a protest against the curfew in Sur district. Meanwhile, Turkey has been reportedly called to the European Court of Human Rights (ECtHR) in Strasbourg to provide defense for allegedly provoking a humanitarian crisis. “Like all countries, Turkey has the obligation, responsibility and right to provide security and comfort to its citizens … In such a situation, the EU has no word to say. And until now, there were no serious criticism … directed at us by the EU,” Volkan Bozkir, Turkey’s minister for relations with the EU, told journalists. ​According to reports, government forces have deployed tanks and begun demolishing houses in the Sur city district in the town of Diyarbakir to make advance in rebel-held area that has been under curfew for 40 days, ANF News wrote on Saturday. People look out from a building which was damaged during the security operations and clashes between Turkish security forces and Kurdish militants, in Sur district of Diyarbakir, Turkey, December 11, 2015. Approximately 60 bodies of Kurdish residents and fighters remain unburied in areas where curfews are imposed, a number of families have launched hunger strikes to get the bodies, Al-Monitor reported. ​Mayor of Adana, a large city in southern Turkey, Huseyin Sozlu, who belongs to the ruling AK party, made a comparison of the fate of modern Kurds with the Armenian genocide of 1915. “What happened to the Armenians can happen to our Kurdish brothers,” Sozlu said, according to Adana paper Ekspres. ​Armenians alongside Assyrians were massacred in Adana in 1909, the rest deported to Syria later. During WWI, 1.5 million Armenians were killed across the Ottoman Empire. Ankara’s current operation against the Kurdish resistance is due to be finished by the end of January, Prime-Minister Ahmet Davutoglu announced, according to Hurriyet daily. Some 200 people have been killed during the blockade and skirmishes between Turkish government forces and local youth resistance YDG-H. Over 100,000 people have reportedly been displaced in ongoing military actions in Turkey’s majority-Kurdish southeast.